The TV display is designed for the lobby and shows the status of people waiting (entries that have not been acknowledged). 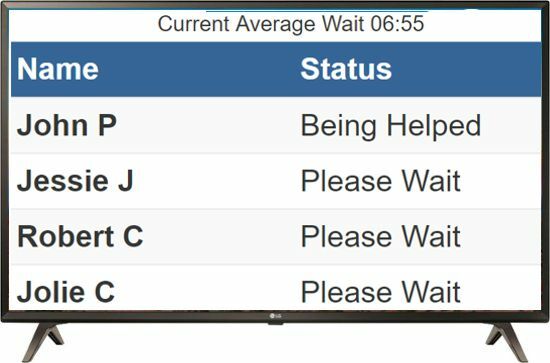 It can optionally show the Average Wait time. 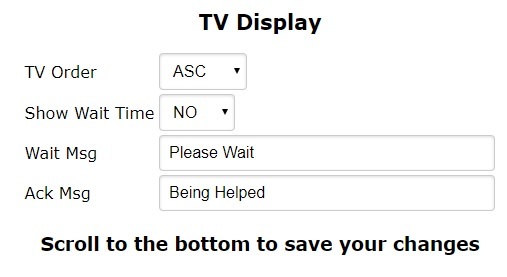 Once an entry has been acknowledged, it will show the Acknowledgement Message on the TV display for 3 minutes. The Acknowledgement message is set in the configuration. "c:\program files\internet explorer\iexplore.exe" -k "https://www.cqueue.com/login/pc/tv/index.php?system_id=SYSTEMID"